I have started building a little garden shed amidst what will be my food forest. After months of very dry weather, the rain has been falling in torrents, which has made what should be a one-day project into a multiple day “wait – maybe the rain is about to stop and we can cut a few more 2 x 4’s!” project. This shed is only a 4′ x 5′, as I had a piece of scrap plywood in that size. Redneck! It will work well for storing long-handled tools, such as my hoes and broadfork, plus I’ll build a set of shelves into the back of it for various amendments, small tools, etc. I’m hoping I leveled out the boulders I used for support on the bottom well enough that they stay put. If not, I may have to jack it up in the future. Probably should have cast some concrete but I was itching to build. We got power last week and I couldn’t wait any longer. Act in haste and repent in leisure, right? Yet he who hesitates is lost! I have scrap galvanized roofing from a neighbor’s shed we are disassembling so the next step is to figure out how to build a roof, then clad the sides with pressure-treated T-111 siding. I have never done anything like this before, my carpentry skills having been limited to building musical instruments and furniture, so the shed is a learning experience for me. 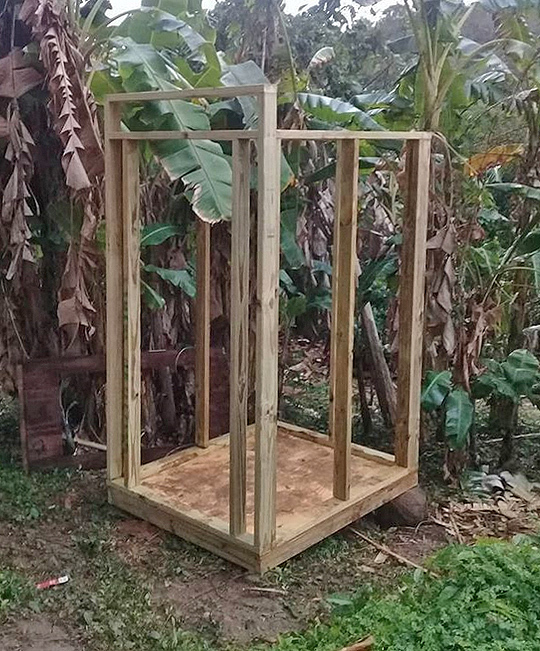 Once it’s done, I’m going to build a temporary bamboo structure with a tarp roof to store my extra lumber, then I will start building a composting outhouse. That will require more time and planning, as I’m going to cast a small slab and use blocks for the catchment chamber at the bottom. We had more heavy rains last night but it’s clearing up now. I don’t think I’ll get back to building today as I’m going to take my mom and family out to visit a beautiful plantation about an hour north of us, but I am very ready to be done with this shed so I can stop carrying tools back and forth to the land every time we visit. Last night I did an “ask me anything” Goodstream and answered a ton of questions. We also discussed how great Pete Kanaris is compared to me. Have a great Wednesday – I’m off playing tourist. Bro, Do You Even Vegan?